In quantum mechanics, the angular momentum operator is one of several related operators analogous to classical angular momentum. The angular momentum operator plays a central role in the theory of atomic physics and other quantum problems involving rotational symmetry. In both classical and quantum mechanical systems, angular momentum (together with linear momentum and energy) is one of the three fundamental properties of motion. There are several angular momentum operators: total angular momentum (usually denoted J), orbital angular momentum (usually denoted L), and spin angular momentum (spin for short, usually denoted S). The term angular momentum operator can (confusingly) refer to either the total or the orbital angular momentum. Total angular momentum is always conserved, see Noether's theorem. "Vector cones" of total angular momentum J (purple), orbital L (blue), and spin S (green). The cones arise due to quantum uncertainty between measuring angular momentum components (see below). In quantum mechanics, angular momentum can refer to one of three different, but related things. where Lx, Ly, Lz are three different quantum-mechanical operators. where ∇ is the vector differential operator, del. There is another type of angular momentum, called spin angular momentum (more often shortened to spin), represented by the spin operator S. Spin is often depicted as a particle literally spinning around an axis, but this is only a metaphor: spin is an intrinsic property of a particle, unrelated to any sort of motion in space. All elementary particles have a characteristic spin, which is usually nonzero. For example, electrons always have "spin 1/2" while photons always have "spin 1" (details below). Conservation of angular momentum states that J for a closed system, or J for the whole universe, is conserved. However, L and S are not generally conserved. For example, the spin–orbit interaction allows angular momentum to transfer back and forth between L and S, with the total J remaining constant. where l, m, n are the component indices (1 for x, 2 for y, 3 for z), and εlmn denotes the Levi-Civita symbol. , where δlm is the Kronecker delta. These can be assumed to hold in analogy with L. Alternatively, they can be derived as discussed below. respectively in mathematics notation), i.e. Lie algebra associated with rotations in three dimensions. The same is true of J and S. The reason is discussed below. These commutation relations are relevant for measurement and uncertainty, as discussed further below. Mathematically, L2 is a Casimir invariant of the Lie algebra SO(3) spanned by L.
In general, in quantum mechanics, when two observable operators do not commute, they are called complementary observables. Two complementary observables cannot be measured simultaneously; instead they satisfy an uncertainty principle. The more accurately one observable is known, the less accurately the other one can be known. Just as there is an uncertainty principle relating position and momentum, there are uncertainty principles for angular momentum. denotes the expectation value of X. This inequality is also true if x, y, z are rearranged, or if L is replaced by J or S.
It is, however, possible to simultaneously measure or specify L2 and any one component of L; for example, L2 and Lz. This is often useful, and the values are characterized by the azimuthal quantum number (l) and the magnetic quantum number (m). In this case the quantum state of the system is a simultaneous eigenstate of the operators L2 and Lz, but not of Lx or Ly. The eigenvalues are related to l and m, as shown in the table below. m is sometimes called magnetic quantum number. This same quantization rule holds for any component of L; e.g., Lx or Ly. This rule is sometimes called spatial quantization. For Sz, m is sometimes called spin projection quantum number. For Jz, m is sometimes called total angular momentum projection quantum number. This same quantization rule holds for any component of S or J; e.g., Sx or Jy. is sometimes called azimuthal quantum number or orbital quantum number. s is called spin quantum number or just spin. For example, a spin-½ particle is a particle where s = ½.
j is sometimes called total angular momentum quantum number. In this standing wave on a circular string, the circle is broken into exactly 8 wavelengths. A standing wave like this can have 0, 1, 2, or any integer number of wavelengths around the circle, but it cannot have a non-integer number of wavelengths like 8.3. In quantum mechanics, angular momentum is quantized for a similar reason. By manipulating these ladder operators and using the commutation rules, it is possible to prove almost all of the quantization rules above. more than the previous entry. eigenvalue gets larger and larger. The only possible resolution is, as mentioned, that there are only finitely many nonzero entries in the ladder. is an integer, so j is an integer or half-integer (0 or 0.5 or 1 or 1.5...). Since S and L have the same commutation relations as J, the same ladder analysis works for them. The ladder-operator analysis does not explain one aspect of the quantization rules above: the fact that L (unlike J and S) cannot have half-integer quantum numbers. This fact can be proven (at least in the special case of one particle) by writing down every possible eigenfunction of L2 and Lz, (they are the spherical harmonics), and seeing explicitly that none of them have half-integer quantum numbers. An alternative derivation is below. Illustration of the vector model of orbital angular momentum. do not commute with each other). is roughly 100000000, it makes essentially no difference whether the precise value is an integer like 100000000 or 100000001, or a non-integer like 100000000.2—the discrete steps are too small to notice. where exp is matrix exponential. In simpler terms, the total angular momentum operator characterizes how a quantum system is changed when it is rotated. The relationship between angular momentum operators and rotation operators is the same as the relationship between Lie algebras and Lie groups in mathematics, as discussed further below. The different types of rotation operators. 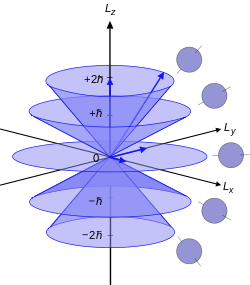 The top box shows two particles, with spin states indicated schematically by the arrows. The operator R, related to J, rotates the entire system. The operator Rspatial, related to L, rotates the particle positions without altering their internal spin states. The operator Rinternal, related to S, rotates the particles' internal spin states without changing their positions. i.e. if the positions are rotated, and then the internal states are rotated, then altogether the complete system has been rotated. carry the structure of SU(2). which is to say that the orbital angular momentum quantum numbers can only be integers, not half-integers. , i.e. the set of states that come about from rotating the starting state in every possible way. This is a vector space, and therefore the manner in which the rotation operators map one state onto another is a representation of the group of rotation operators. When rotation operators act on quantum states, it forms a representation of the Lie group SU(2) (for R and Rinternal), or SO(3) (for Rspatial). The ladder operator derivation above is a method for classifying the representations of the Lie algebra SU(2). Classical rotations do not commute with each other: For example, rotating 1° about the x-axis then 1° about the y-axis gives a slightly different overall rotation than rotating 1° about the y-axis then 1° about the x-axis. By carefully analyzing this noncommutativity, the commutation relations of the angular momentum operators can be derived. due to the relationship between J and R. By the Ehrenfest theorem, it follows that J is conserved. To summarize, if H is rotationally-invariant (spherically symmetric), then total angular momentum J is conserved. This is an example of Noether's theorem. ). Alternatively, H may be the Hamiltonian of all particles and fields in the universe, and then H is always rotationally-invariant, as the fundamental laws of physics of the universe are the same regardless of orientation. This is the basis for saying conservation of angular momentum is a general principle of physics. For a particle without spin, J = L, so orbital angular momentum is conserved in the same circumstances. When the spin is nonzero, the spin-orbit interaction allows angular momentum to transfer from L to S or back. Therefore, L is not, on its own, conserved. Often, two or more sorts of angular momentum interact with each other, so that angular momentum can transfer from one to the other. For example, in spin-orbit coupling, angular momentum can transfer between L and S, but only the total J = L + S is conserved. In another example, in an atom with two electrons, each has its own angular momentum J1 and J2, but only the total J = J1 + J2 is conserved. all have definite values, as the latter four are usually conserved (constants of motion). The procedure to go back and forth between these bases is to use Clebsch–Gordan coefficients. ^ Aruldhas, G. (2004-02-01). "formula (8.8)". Quantum Mechanics. p. 171. ISBN 978-81-203-1962-2. ^ Shankar, R. (1994). Principles of quantum mechanics (2nd ed.). New York: Kluwer Academic / Plenum. p. 319. ISBN 9780306447907. ^ H. Goldstein, C. P. Poole and J. Safko, Classical Mechanics, 3rd Edition, Addison-Wesley 2002, pp. 388 ﬀ. ^ a b c d e f g Littlejohn, Robert (2011). "Lecture notes on rotations in quantum mechanics" (PDF). Physics 221B Spring 2011. Retrieved 13 Jan 2012. ^ Griffiths, David J. (1995). Introduction to Quantum Mechanics. Prentice Hall. p. 146. ^ a b Griffiths, David J. (1995). Introduction to Quantum Mechanics. Prentice Hall. pp. 147–149. ^ Griffiths, David J. (1995). Introduction to Quantum Mechanics. Prentice Hall. pp. 148–153. ^ Bes, Daniel R. (2007). Quantum Mechanics. Berlin, Heidelberg: Springer Berlin Heidelberg. p. 70. ISBN 978-3-540-46215-6. Retrieved 2011-03-29. ^ Schwinger, Julian (1952). On Angular Momentum (PDF). U.S. Atomic Energy Commission.